This book covers the ever-increasing problem of information overload from both the professional and academic perspectives. 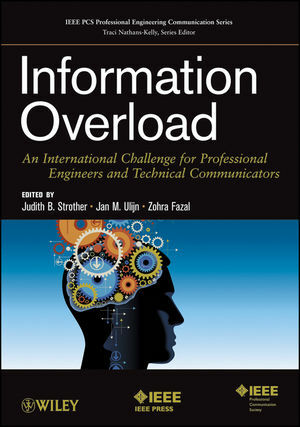 Focusing on the needs of practicing engineers and professional communicators, it addresses the causes and costs of information overload, along with strategies and techniques for reducing and minimizing its negative effects. The theoretical framework of information overload and ideas for future research are also presented. The book brings together an international group of authors, providing a truly global point of view on this important, rarely covered topic. JUDITH B. STROTHER, PhD, is Chair of the Graduate Program in Global Strategic Communication and Professor of Communication at Florida Institute of Technology in Melbourne, Florida. She has written three books and several book chapters, in addition to journal articles and conference proceedings. JAN M. ULIJN, PhD, is an early emeritus of the endowed Jean Monnet Chair in Innovation, Entrepreneurship and Culture at Eindhoven University of Technology, and currently Professor of the Open University School of Management in the Netherlands. He has written numerous journal articles and book chapters and has authored or edited several books. ZOHRA FAZAL is Instructor of Humanities and Communication and a founding member of the Center for Communication Excellence at Florida Institute of Technology. She is currently pursuing her PhD in science education.